Students can wear t-shirts or polo shirts with the GVA logo. Items can be purchased from our school vendor, Land's End or you may purchase a polo and have it embroidered at our preferred embroidery shops. Aurora: All colors except for black. Middle Schoolers may wear black polos. Northglenn: All colors except for black. Middle Schoolers may wear black polos. They can be purchased anywhere and DO NOT need a logo. Douglas County & Fort Collins: Only items with a GVA logo will be allowed. If you have any questions, please email excelartwork@gmail.com. 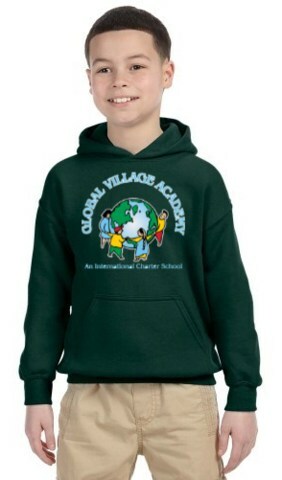 All Global Village Academy students are required to wear school uniforms each day. All families who do not have internet access please contact the Main Office to arrange your uniform purchase. GVA’s logo is property of Global Village Academy. This logo may not be used for any reason without written permission from the school’s administration. Outside vendors are not authorized to embroider on shirts that are brought to them.